Meringue has the reputation of being tricky, prone to failure and delicate to handle. A stand mixer is half the battle, as properly whipped meringue is less likely to flop. And the slow, low-temperature baking of these lemon almond meringue cookies is easier on the egg foam than a meringue pie topping’s higher heat requirements (to achieve those golden-brown points). Thanks to a pastry bag and an oversized star tip (I used a Wilton 1M, but could have gone larger if I had these Ateco jumbo pastry tubes) the rosette cookies look elegant and offer an ethereal yet nutty crunch. 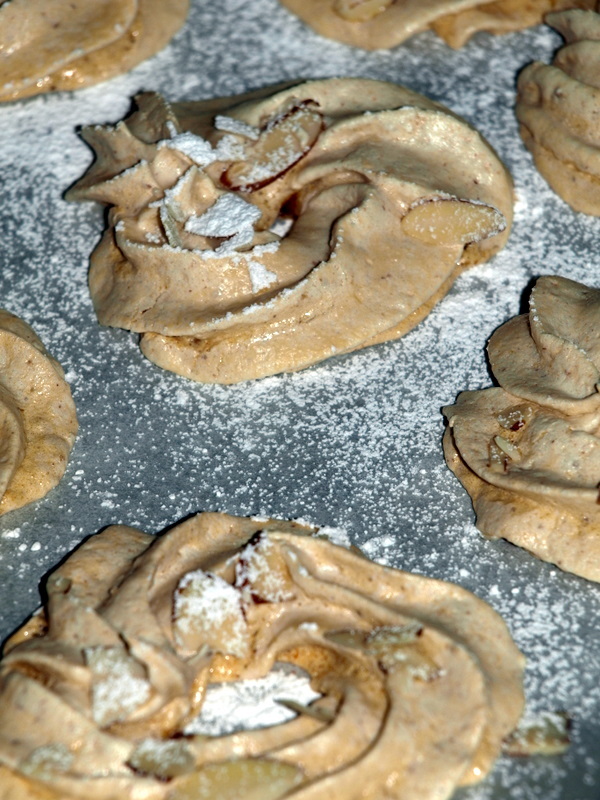 Alone or alongside a scoop of chocolate gelato, the meringues are a low-fat indulgence. I’m trying not to eat one every time I walk through the kitchen.